Welcome to Wedding Cakes by Joan, the home of the most exquisite creations and of the most refined tastes. 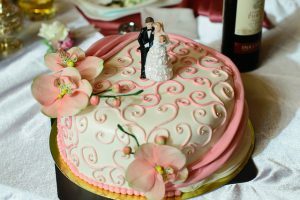 If you are a bride to be, in search for her perfect wedding cake, you should look no further, as you’ve come to the right place. I’m Joan, and by biggest passion in life is to design and make wedding cakes. I love to put my creativity to good use, as making people happy is my mission on this planet. My love story with wedding cakes is a very old one. During the past 15 years, I’ve created thousands of cakes and I’ve made just as many brides happy. The most important day of their lives has been properly marked and celebrated. Many of them have told me their guests were impressed with the cake. Some of these guests have become my clients, too. At Wedding Cakes by Joan, we take pride in using only the best ingredients. None of our creations uses synthetic colorants. We obtain our colors only from natural ingredients such as fruits and vegetables. We choose our suppliers very carefully, thus being able to provide our clients the tastiest and healthiest cakes and cupcakes. Not only do we pride ourselves on using the best ingredients available, but we also purchase and use the best industrial ovens and bakery machines in the industry in order to produce our delicious multi-layered wedding cakes for sale to individuals and to local grocery stores. You can visit the site of our oven provider to learn more about their industrial ovens. Our experts can work together with you for designing the cake concept that best matches the theme of your wedding. If you don’t have a special theme, you may still want your cake to transmit a message or an idea. We can help you do that. We’ve got the needed equipment and the skills to create romantic sugar figurines such as doves, lovers, hearts, and roses. Professionalism and punctuality are two of our most important values. We know everything has to be ready in time for your wedding day, so we never allow delays to ruin your big event. We’ve never let down a client, so we can safely say you’re going to have your cake delivered exactly when you want it and where you want it. We’ve got something to appeal to every palate. Some of our clients prefer the exquisite taste of dark chocolate with a hint of mint. Others prefer the romantic vanilla flavor. Others love cheesecake and lemon. Whatever your preferences, we’ve got at least one recipe to meet them. If needed, we are happy to invite you to taste our creations. A few times a year, we organize an open house, which is a special event designed to enable our clients to meet our products. We usually make several mini-cakes with various textures, flavors, and ornaments, thus allowing you to experience first hand our talent and professionalism. Most clients love Wedding Cakes by Joan, as you can see from our testimonials. Many brides have sent us photos of themselves cutting the cake. This is perhaps one of the most exciting moments of a wedding, so we are delighted to help all these people impress their guests. If you are interested in one of our cakes, contact us today and let us help you the best way we can.